The Catholic faith in Canada's maritime provinces of New Brunswick (from whence came my mother), Nova Scotia, Prince Edward Island and the Province of Newfoundland, is in free fall. From Saint John to Moncton, from Antigonish to Halifax, Charlottetown to St. John's. We can blame faithless bishops and pervert priests, but the fact is, there is nobody to blame but the once faithful Catholics who cared not enough about their faith to fight for it. This is the parish of Holy Trinity where a small community within the parish began a small Latin Mass apostate. Gone. Along with the church. Tragic. But the powers that be don't care, and most of the "Catholics" don't care, so what can you do. Still, I'd rather burn a church to the ground than see it sold for a mosque. When the Lord returns we won't need these buildings anyway. Personally, I CAN blame faithless bishops and pervert priests for the loss of faith among once faithful Catholics... it's happening to me! Dan, if that were entirely true, you would not be reading or commenting on this blog. It is YOUR responsibility to keep your faith. Brother, do not let these bastards drive you out! I can't find evidence of a TLM community, only the Cornerstone Baptist Church. Was the TLM celebrated in this church? Found it. It's Holy Trinity. Personally, I prefer the banquet hall decor over their horrid Novus Ordo set up anyday. We witnessed our wonderful ecclesia dei priest being forced to train a perv Diocesan the TLM , only then to be forced out by the perv Bishop who permitted him to start a Traditional Mass Diocesan Mission Church. Now there is whole new group of pew people populating the parish who are clueless as to what and who is celebrating the Mass there. The new "priest" graduated with and parties with his seminary grad class disordered crowd in this Diocese. Former rectory employees have confided what they have seen and heard in their rectories despite being threatened to keep their mouths shut . "What happens in the rectories must stay in the rectory." ,is what they have been told. Now tell me,are these men even Ordained priests surely not having the Proper Intention for reception of the Sacrament of Holy Orders after being recruited by a homosexual Diocesan Vocation Director and Seminary Rector? AMEN, Vox!! Dan: These men do NOT represent the Church of Christ! But that doesn't mean that the Church of Christ no longer exists! When Christ said: "The gates of hell shall not prevail against my Church"....he meant that Satan would not be able to completely destroy His Church. The key word here is 'prevail'. He (I don't think) ever intended to say that the Church wouldn't be assaulted. The Church has been beat to a pulp before and not gone away. The same will happen this time. Yes, we are getting beat to a pulp by bastards that don't have a Catholic bone in their bodies, but....Christ will never leave us in His Church. They will never 'kill' the Church, even if some day we have to go underground to practice the faith. Even if there are very few left. Please trust His words...His promise! I know it has been very very painful to watch all this happen, for all of us! I myself was so distraught after the Penn. report and McCarrick and the financial corruption that goes all the way to Rome that I didn't go to Mass for 2 weeks. But.....I prayed the Rosary and the Blessed Mother helped me see that leaving was tantamount to leaving Jesus side on the Cross. She brought me back. I will not leave Him on the Cross!! As Fr. Holloway said in a recent interview by Dr. Marshall: "Instead of leaving the burning building, we have to learn to run back into it!" To FIGHT for it! To FIGHT for His Church successful or not, and try with all of our heart and soul to help other souls reach their heavenly home. (and in this way we will save our own!) Yes, it's tough, but we were BORN for this! During this time in the history of the Church, the 'Church Militant' has never been more important! That's US!! The Church is being crucified, but will never die forever, and Christ will NEVER leave us! Hang on if even by your fingernails! Prayers for you and all of us! May God bless you and the Blessed Mother protect you and keep you under her Mantle. Rats can be illigit AND INVALID if they became priests because they are sodomites who wish respect and access to other young men. ALL Sacramental Receptions without the Proper Intention are invalid. Dear Vox. You are spot on right when you remind people that they have the responsibility to learn and keep the Faith. True Anonymous 4:18. And so......how is one to KNOW who is who unless they are outed by victims? At least that is beginning to happen with some, but it's slow going. Can you define clericalism? You do know it is a derogatory term first used by enemies of the Catholic Faith. And let us remember who has the authority and protection of the Holy Ghost to teach us the Faith. binding; of preserving and passing on the Faith, intact and incorrupt, as he received, it under the guidance and protection of the Holy Ghost. The pope is the sovereign Visible Head of Christ's Church and the Vicar of Christ. He rules the Church by the authority of Christ Himself. Christ's Church is a Monarchy. It is not a Democracy. He is the Teacher, we are the Taught. In matters of Faith, Morals and Church Governance, we obey him as we would submit to and obey Christ Himself. This is not "papolatry", this is Catholic doctrine. Of course none of this applies to bergoglio and judeo-masonic mates, who is/were not Pope/s, or Catholic/s. Of course, this modern fashion of laymen, or any cleric, sifting the teaching of him whom they recognize as being a true Pope, according to their own opinions, is a gross protestant aberration unknown to Catholics. "In fact, Venerable Brother, you are not ignorant of the truth that nothing should be nearer to a Catholic Bishop, nothing is more obligatory for him, than heartfelt respect for the supreme power of this Chair of St. Peter, whence flows sacerdotal unity, the ordination of bishops, and the government of the Church; than to defend with all his strength the rights of this See and to honor them, splendid as they are with an authority, not human, but divine; than to attach himself firmly to the Sovereign Pontiff, to recognize him, faithfully to render to him all respect and obedience, this Pontiff, placed in this See, who has received from Our Lord Himself in the person of the Blessed Prince of the Apostles, all power to feed the sheep and the lambs, to confirm his brethren, to rule and govern the whole Church throughout the world. There is plenty more, but I will stop for some sort of brevity. Space is inadequate to discuss Papal Infallibility, but let me squeeze a few facts in: Vatican I did NOT limit the Pope's Infallibility; the Ordinary Universal magisterium is every bit as infallible as the Solemn magisterium; the Solemn magisterium is simply part of the Ordinary magisterium; Catholics are obliged to submit to both. But remember: None of the above applies to bergoglio et al! Bravo Peter Lamb. It could not be said more clearly or definitively. The faithful have no right whatsoever to resist their duly authorized teachers on faith and morals. Good Lord Lamb You are a Knee Jerk Papal Loyalist in search of a Pope to obey without using your intellect. What Saint Vincent of Lerins taught in his Commonitorium is putatively gainsaid by the opinion of a Canon? You got that from your Pope Mario Derksen, didn't you? As to the other citations, they all presuppose that which is being taught is not novelty. Guess which Saint was cited by Vatican 1? Saint Vincent - footnote 26 if memory serves) so your argument is that Vatican 1 got it wrong in citing the work you claim is invalid. 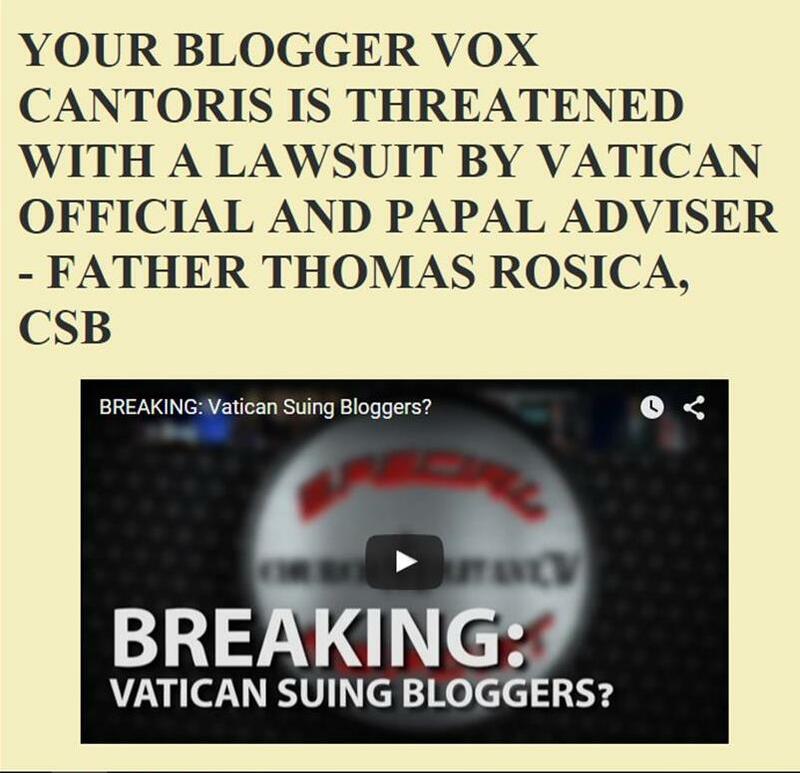 ABS, you discredited yourself on multiple blogs in defending your Bishop Barbarito who slandered a priest for turning in a credible clerical pederast who admitted the Bishop knew he abused boys in India too and who was sentenced to six years in jail. Fr John Gallagher ONLY lost his Libel suit against the Bishop because the Diocesan Lawyers pulled out the separation of church and state card trying to turn the Bishop's libelous claim of Fr Gallagher's insanity the Bishop launched, into a disgruntled employee of the church case. This is why more hetero priests do not blow the whistle on the perverts who live and act out among them , because they know the legal game plans of the Bishops. Barbarito is even ON RECORD in his previous Diocese for stating to the Press that no pederast priest's name should ever be made public. This is the Bishop ABS defends because he knows people who did not like Fr Gallagher .Reason? He did not go outside and shake hands with the Hispanic parishioners after Mass. God Bless this decent priest! I guess the takeaway from this episode is that the Bishop of W Palm concluded Fr Gallagher must be nuts if he thought the V2 church would do the right thing. In case you missed it Opus Dei JP2 with his pro life message lured many decent people into the church and the priesthood . Most of them youth and converts whom OD likes best because they did not have their eyes open pre and during Vat 2. Not their fault but the snakes bit them anyway. The Lain Mass community in Saint John is still here despite the closure of Holy Trinity and the moving of our priest to Fredericton. We have a First Saturday Mass every month at St. Pius X Church and we have formed the Saint John Latin Mass Society as a chapter of Una Voce Canada. We may be down but we are not out. Please pray for us. Actualización del «Denzinger-Bergoglio» - ¡La versión COMPLETA del Denzinger-Bergoglio! La entrada Actualización del «Denzinger-Bergoglio» se publicó primero en .